Exciting, thought-provoking and riotously funny—in addition to being more tightly plotted than many of Pratchett's books. Just about the perfect YA fantasy! Tiffany Aching is a wonderful, unique protagonist, and her titular sidekicks are a hoot. 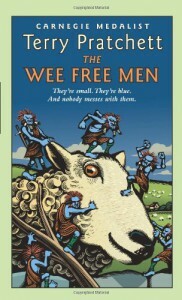 Only Terry Pratchett could take a fantasy novel about an old-beyond-her-years nine-year old, add a group of six-inch-tall Scottish hooligans, and turn it into a thought-provoking exploration of the living nature of stories.